"Monkey Sea, Monkey Doom!" Fry answers an old comic book ad promising a fun bowl full of Sea Monkeys. However, the sea monkeys become contaminated with gamma radiation. This causes them to grow to a humongous size, before terrorizing New New York. "...But Deliver Us to Evil!" The Planet Express crew show two aliens, Rick and Lucy, the 'tricks of the trade' of delivering packages. 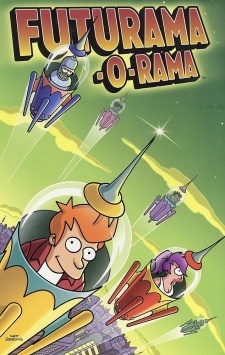 Rick and Lucy suddenly hold Fry, Leela, and Bender hostage, and attempt to hijack the ship and take it to their home planet. "The Owner of Mars Attacks!" Leela battles it out with Inez Wong to build the biggest Needy Newbie collection in the known universe. However, the Professor uncovers a dark secret that could lead the newbies to destroying planet Earth. "DOOP the Right Thing!" Leela is summoned by Zapp Brannigan, who has recently become the king of a Da Nang tribe. Leela is told by the DOOP that she must try and get Zapp to leave the tribe. However, she discovers that the tribe doesn't worship Zapp at all, and that they are just using him as an incubator for their young. All four stories are written by Eric Rogers.